This is a heat map. The green boxes represent stocks that ended Thursday, October 18 higher than the day before. 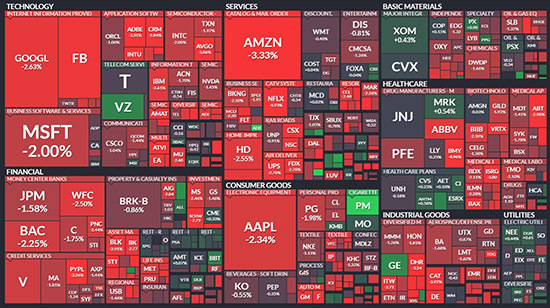 The red ones represent stocks that fell on the day. You can see that there are far more red boxes than green ones. And that’s because U.S. stocks got pummeled last Thursday. 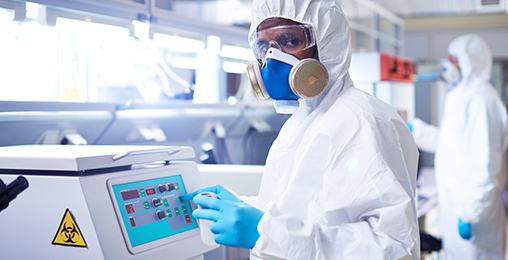 A new medical discovery recently approved by the FDA could destroy the pharmaceutical industry as doctors use it to smash the barriers set up by Big Pharma. But the U.S. stock market isn’t just coming off one bad day—all of October has been rough. The S&P 500 is down 5% on the month. The Nasdaq is down 7%. And the iShares Russell 2000—an index that tracks smaller, publicly traded companies—has fallen 9%. One sector in particular had a huge week. I’m talking about gold stocks, one of our top speculative recommendations here at Casey Research. Acacia Mining is up 12% this month. Barrick Gold is up 19%. And AngloGold has gained 14%. And the VanEck Vectors Gold Miners ETF (GDX), a popular gold stock fund, has jumped 7%. 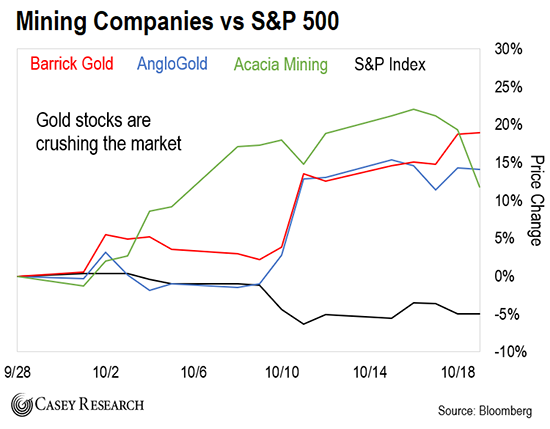 As you can see, gold stocks aren’t just hanging in there. They’re crushing the market… and I believe this rally is just getting started. I’ll tell you why in a second. But first, let’s look at why they’re rising when most stocks are falling. It’s up 5% since mid-August. And it’s rising for a simple reason: Gold is doing its job. 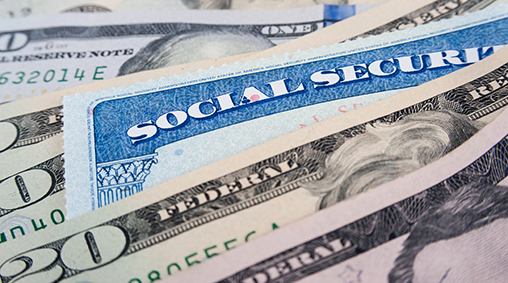 Politicians have—yet again—screwed everyday Americans by hiding a secret retirement income source that dates all the way back to President Nixon. Longtime readers know what I mean by this. In short, gold is money. It has preserved wealth for centuries. You can’t say the same thing about the countless paper currencies that have come and gone throughout history. Gold is also a safe-haven asset. Investors run to it when they’re nervous about the stock market. And right now, there are good reasons to be worried about U.S. stocks. The black line in the chart below is the S&P 500. The green line is the S&P 500’s 200-day moving average (MA). The 200-day MA is a key indicator for many traders. It’s calculated by taking the average price (value) of a stock (or index) over the last 200 trading days. In other words, it’s a good indication of a stock or market’s overall direction or trend. 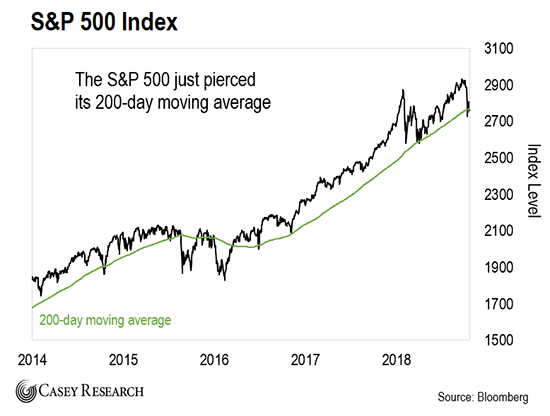 Above, you can see that the S&P 500 recently pierced its 200-day MA. That’s not a good sign… But the S&P 500 quickly recovered and is now sitting on this important trendline. In other words, the S&P 500 may have just had a routine pullback. But it’s certainly not out of the woods yet. So consider using this as an opportunity to get defensive. Think about taking profits on some of your riskier positions and holding more cash. That said, the easiest way to bet on gold stocks is with a fund like GDX. This fund invests in a basket of gold miners. That makes it a relatively safe way to profit from a rally in gold stocks. Of course, you’ll need to own the “best of breed” gold stocks to pocket the biggest gains during the next gold bull market. Unfortunately, most investors don’t know where to find those. They can’t tell the difference between a world-class miner and a crummy one. At Casey Research, we have an advisory dedicated to small mining stocks with massive upside potential called International Speculator. And editor David Forest has found the highest-potential gold stocks today. They’re primed to rip higher when the gold market rebounds. He currently has more than 20 buyable gold stocks in his portfolio. All are starting to heat up… And all have huge upside potential. If you’re a gold bull like us, you can’t afford to sit on the sidelines. You can sign up for David’s International Speculator letter—and see his newest money-making idea—by clicking here. I am a sports enthusiast and have recently heard several of the game announcers/analysts use the term “physicality.” Is that a word? As for my most hated misused word, it must be the phrase “reach out” when the meaning is actually to contact someone else (by phone, mail or email). I am severely tempted to bite the hand of any newsletter writer who claims to be reaching out to me! NeoCon? “New” conservative? No. There are so many variants of this term that it seems to have no widely held definition. However, the most basic and accepted definition according to Merriam-Webster is: 1) a former liberal espousing political conservatism. 2) a conservative who advocates the assertive promotion of democracy and U.S. national interest in international affairs including through military means. Two that came to mind right away: The Democrats’ use of the word “cut(s)” in some x, y, or z program budget when in reality it was a lessening of the requested increase. “Living Constitution” a favorite of those who view the Constitution as an impediment. We can make it mean whatever we want it to mean. Along those lines, they are also fond of quoting the “general welfare” provision (1-8-18) as an excuse for any law, completely ignoring that it only applies to that section of the Constitution. Otherwise, the Constitution would just need one sentence! How about “literally”? It figuratively makes me sick to hear it overused as the opposite of what it originally meant. I suppose it literally does little harm except to irritate those who care about language. And as always, if you have any questions or suggestions for the Dispatch, send them to [email protected].